20th-Jan-2019 11:55 pm - Baccano Fans!!! Summary: Dark!fic with dark!humor. The prompts are: asphyxiation, dub-con, fear, on the run, and threats. 19th-Sep-2012 05:54 pm - Hey guys, guess what I picked up today? Apologies if I missed any! Which dialect is Claire supposed to be using? I’m going to eventually make a compilation of audio that one can use to help mimic the dialect, so if you have any names / movie titles / etc. that can be of use I’d appreciate it. If you know about any of the other characters, that would be useful too, but at the moment I am mainly interested in Claire. 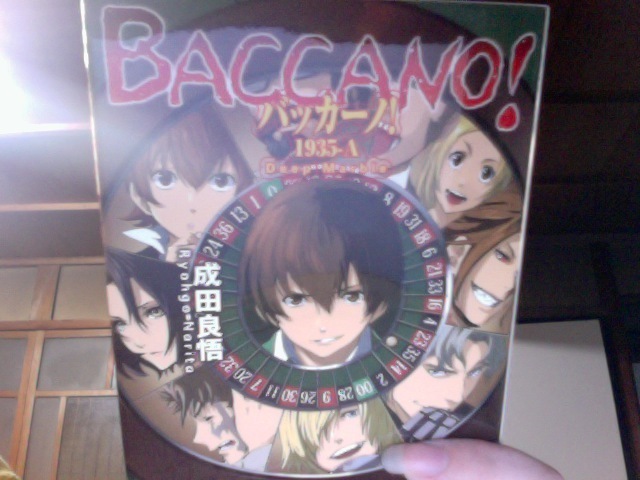 Is anyone interested in making a Baccano doujinshi with us (I am a writer and my wife an artist)? On our side, we would focus on Ladd and Claire, and we are 99% into comedic stuff, but you can do whatever you want of course. A sample of some pages in progress that we could add to it is here, and other than that, we have thought up a lot of Ladd and/or Claire-related gag oneshot pages, like this doodle. We can use a site like this to publish it, and we could do a release in English and maybe Swedish, and if you feel like it you could also translate it to another language that you know. But the most important part is getting help, we are too busy to make a full doujinshi by ourselves so we need at least one more person to add some pages!! Even if it is totally unrelated, ex. if you are only writing very serious LuckxEve stuff. So please contact us if interested, you can message here, on that tumblr, or you can also message us at “plumbroth” on skype. 3rd-Sep-2012 04:51 pm - New Novel! Guess who's returning this upcoming fall? I'm so glad that 1935 is going to be a multi-volume plot! We've got so many loose ends to clean up in that timeline. By the way, does anybody recognize the bearded man hidden right behind the title? The nameless doctor from Flying Pussyfoot, perhaps?